Here’s how to get out of town for the weekend without booking ahead, and where to go for maximum fun. 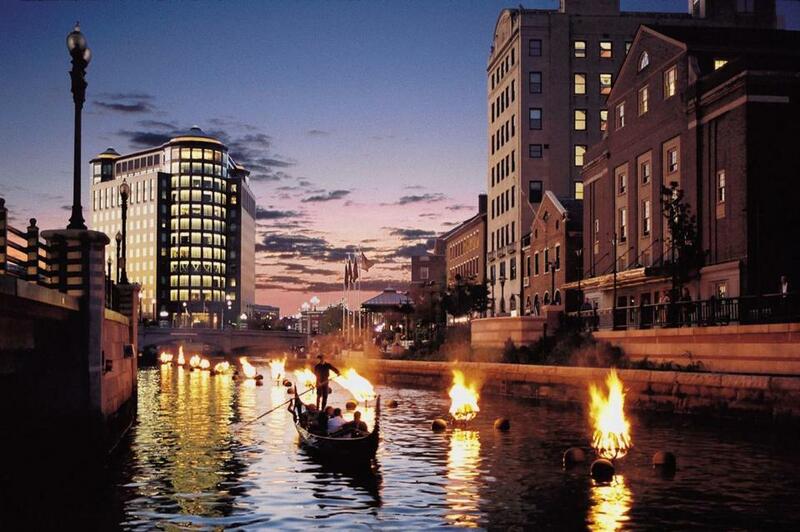 WaterFire, a series of 100 bonfires suspended just above the surface of the Providence, Woonasquatucket, and Moshassuck rivers. Most of the time, a bite from the travel bug leaves a persistent itch — a slow, gnawing sense of restlessness. But every so often, it stings like a hornet, triggering an acute and sudden case of wanderlust. Sitting in traffic or midway through your Friday morning meeting, an animal instinct sets in . . . your leg starts twitching, your mind races away in all directions, and all you can think of is escape. There’s no sense fighting it: Whether it’s been a grueling week at work or you’ve been cooped up too long, you’ve gotta get outta here, and pronto. Here are eight getaways you can throw together on short notice, along with some apps to speed you on your way. My wife, whose parents owned an Italian bakery outside of New York City, is typically unimpressed by North End fare, preferring Providence’s pastries and pasta to the offerings around here. On our most recent visit, the homemade Italian dishes and casual elegance of Rosalina (rosalina-ri.com) felt more luxurious than the bill would suggest. We stayed around the corner at the Dean Hotel (thedeanhotel.com), a boutique hipster spot with a coffee shop in the lobby and quirky maps designed by RISD students with points of interest for the kids. Tickets to see the Providence Bruins play nearby were cheap and easy to come by, even on a Friday night, and the next morning, we wedged ourselves into a table at the adorable and aromatic Ellie’s Bakery (elliesbakery.com) for coffee and savory breakfast sandwiches with tomato jam. 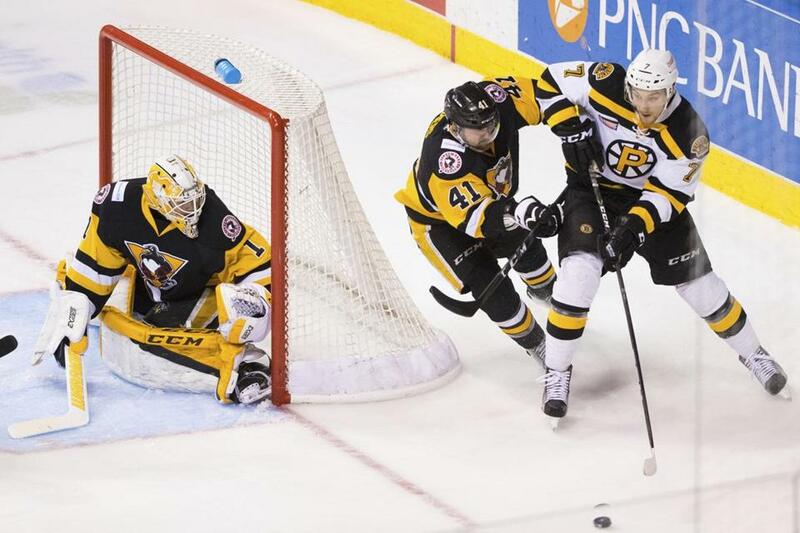 The Providence Bruins in action against the Wilkes-Barre/Scranton Penguins. Home to some of New England’s best breweries, Portland’s food scene is also unrivaled for a city of its size. While you may not nab a table at Fore Street without booking in advance, some of the city’s treasured restaurants — such as Duckfat (duckfat.com) — are casual, kid-friendly, and don’t take reservations. At the worker-owned and sustainably sourced Local Sprouts Cooperative (localsproutscooperative.com), a kids play area meant more time for the grown-ups to sip coffee and devour pancakes amid the mismatched furniture. If you’ve got little ones in tow, the Children’s Museum & Theatre of Maine (kitetails.org) offers four floors of fun for young children; the last time we went, our daughter got to make and decorate her own hula hoop in a small craft workshop. From downtown, walk or bike the 2.1-mile waterfront trail that runs along the gorgeous Eastern Promenade — or view it aboard the antique trains of the Maine Narrow Gauge Railroad Co. & Museum (mainenarrowgauge.org), which follow the same scenic route. 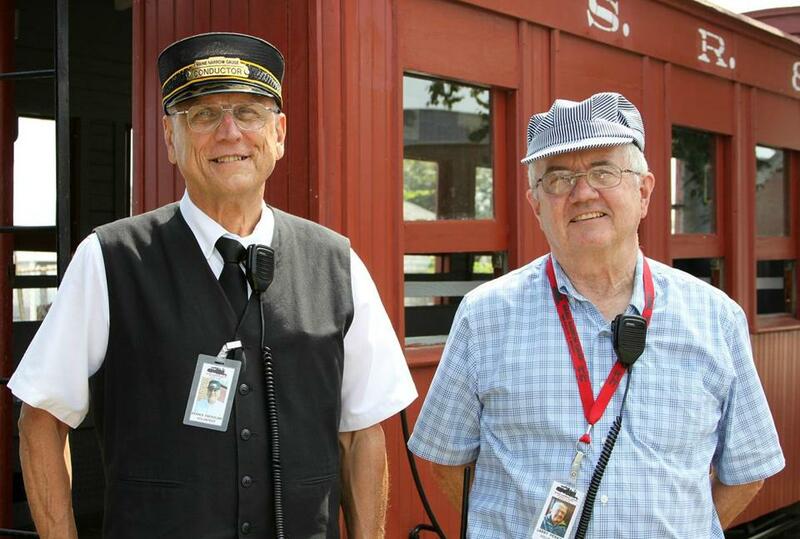 Conductor Dennis Pachulski, at left, and engineer Larry Perkins of the Maine Narrow Gauge Railroad Co. & Museum. The Omni is midway between two popular parks for younger kids: StoryLand (storylandnh.com) is a half-hour south in Glen, while the North Pole-themed Santa’s Village (santasvillage.com) is a half-hour north, in Jefferson. While kids get spoiled with an assortment of on-site activities and milk and cookies delivered by room service, parents can get pampered, too. The 25,000-square-foot mountain-view spa, with four lounges, heated pool, and a eucalyptus steam room, offers dozens of indulgent treatments with herbs and botanicals that are native to New Hampshire. Characters from “The Cat in the Hat” at the Dr. Seuss Museum in Springfield. With miles of paved bike paths and hiking trails and the abundant arts offerings of the Five College Consortium, there’s really no offseason in the Pioneer Valley. The area’s cultural hub of Northampton feels like Cambridge in the countryside: Less than two hours from Boston, it has an improbable number of restaurants, indie bookstores, art galleries, and music venues —like the legendary Iron Horse Music Hall (iheg.com), which hosts live acts nearly every night. If it happens to be the second Friday of the month, leave work early to roll into town in time for Arts Night Out (artsnightout.org), a free citywide open studios and gallery stroll. And, of course, check the five colleges themselves (Amherst, Hampshire, Mount Holyoke, Smith, and UMass Amherst) for information on free events, art museums, and botanical gardens. We usually wind up at historical Hotel Northampton (hotelnorthampton.com), located in the heart of this pedestrian-friendly town. But we’ve also stayed across the river in Amherst at the Lord Jeffery Inn (lordjefferyinn.com), which was just about as fancy as it sounds. At Northampton’s Look Park (lookpark.org), the petting zoo, pedal boats, and mile-long steam-train ride delighted our young daughter, while the Eric Carle Museum of Picture Book Art (carlemuseum.org) in Amherst is an art museum even little kids will love. 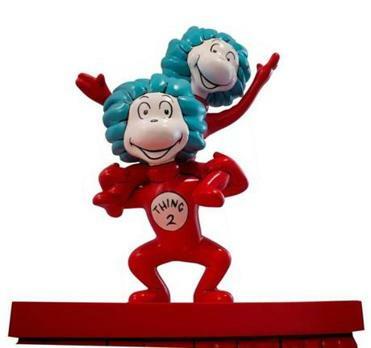 For those heading back to Boston, consider a stop in Theodor Geisel’s hometown of Springfield for the new Amazing World of Dr. Seuss Museum (springfieldmuseums.org); walk-up tickets are available, but it’s helpful to reserve an upcoming time slot online. I’ve wasted enough cumulative months of my life sitting in Boston-area traffic that a weekend without the car is a journey into the sublime; throw in a boat with booze available, and it’s practically heaven. Though not cheap, the fast ferry (bostonharborcruises.com) runs through Columbus Day and whisks you from Long Wharf to the tip of Cape Cod in 90 minutes (a separate fast ferry service from the Seaport runs through October 16). Even with the summer crowds and excitement ratcheted down a notch, P-town is still plenty lively on fall weekends, and just about everything is within walking distance from the pier. Labor Day can’t stop a century-old arts and theater scene from squeezing in another season, with many galleries and the Provincetown Art Association and Museum (paam.org) remaining open year-round and the annual Tennessee Williams Theater Festival (twptown.org) running from September 21 to 24. As is coastal custom, you’ll pay a premium for waterfront dining but can often find better food, sans vista, across the street. Still, that’s never stopped us from ordering seafood and beer above the harbor at the boisterous Canteen (thecanteenptown.com) or trying to score a table at the more upscale Mews Restaurant & Cafe (mews.com). P-town’s lodging stock is heavy on bed-and-breakfasts and small inns, which often require advanced bookings or multiple-night minimum stays — both kryptonite to a hastily planned trip. However, if you don’t mind working the phones, you can often find a room that fell through the cracks of the calendar by calling the day of your visit; the Chamber of Commerce also posts last-minute room availability on its website (ptownchamber.com). One of our favorite splurges is Carpe Diem (carpediemguesthouse.com), an upscale spot with beautifully appointed rooms, on-site spa, and an exuberant nightly wine hour, where we became fast friends with guests from all over the world. 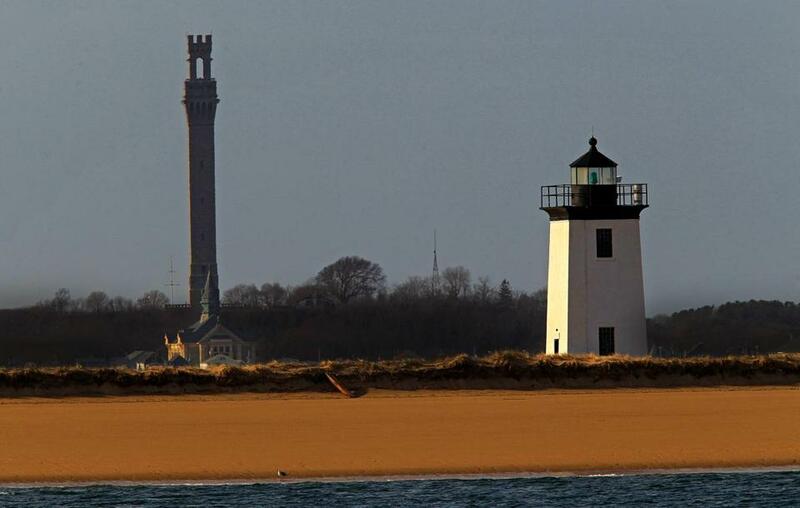 The Pilgrim Monument (at left) and the Long Point Lighthouse on the Provincetown shoreline. With its covered bridges, stroll-inducing boutique shops, and rolling farmland backdrop, Woodstock is a Quaint Vermont Town straight out of central casting. Nestled next to several parks, including the Marsh-Billings-Rockefeller National Historical Park, there are miles of connected trails in virtually any direction; many hikes begin at the charming Billings Farm (billingsfarm.org), a working dairy farm and outdoor history museum. A moderate, roughly 4-mile loop ambles past pastures and a mountain pond on its way up the south peak of Mount Tom, where a panoramic view of Woodstock village awaits. For a gentler walk, try Quechee Gorge one town over, where a smooth, wide path slopes 165 feet down into Vermont’s deepest gorge. For every action there ought to be an equal and opposite relaxation, which you’ll find at the luxurious Woodstock Inn & Resort (woodstockinn.com). The clean and green LEED-certified spa offers all manner of indulgent body treatments, including a personalized “Signature Experience” where you design your own aroma, and a menu of “spa tapas” — 20-minute sessions you can order a la carte. Last-minute lodging is easier to land after peak foliage season and before nearby ski resorts like Suicide Six and Killington open up for the winter. Ever wonder where professional foodies go for the weekend? “My current obsession for a last-minute getaway is Portsmouth and Kittery,” says Eater Boston editor Rachel Leah Blumenthal. Portsmouth’s celebrated dining scene has earned its reputation, but Blumenthal also recommends venturing over the bridge into Maine. Kittery’s Wallingford Square, a 1-mile walk from Portsmouth’s Prescott Park, “is full of excellent food and drink,” she says. In Kittery, start with a late lunch of pork bun and spicy miso ramen at Anju Noodle Bar (anjunoodlebar.com), Blumenthal says, then grab a cruller at Lil’s Cafe (lilscafe.com) next door. Afterward, spend a few minutes strolling through Maine Meat (memeat.com), a locally sourced butcher shop, before popping into the cozy Wallingford Dram (thewallingford.com) for a dazzling late afternoon cocktail. Finish off with dinner or bar snacks and an excellent selection of craft beers at Black Birch (theblackbirch.com), which is first come, first served — perfect for last-minute types. Meanwhile, for a city the size of a sleepy suburb, Portsmouth is positively throbbing with things to do. For drama, check out the Seacoast Repertory Theatre (seacoastrep.org). The Music Hall (themusichall.org) has live music and curated cinema, and the Portsmouth Book & Bar (bookandbar.com) boasts books, beers, and bands all in one historic space, Portsmouth’s old Custom House and Post Office. 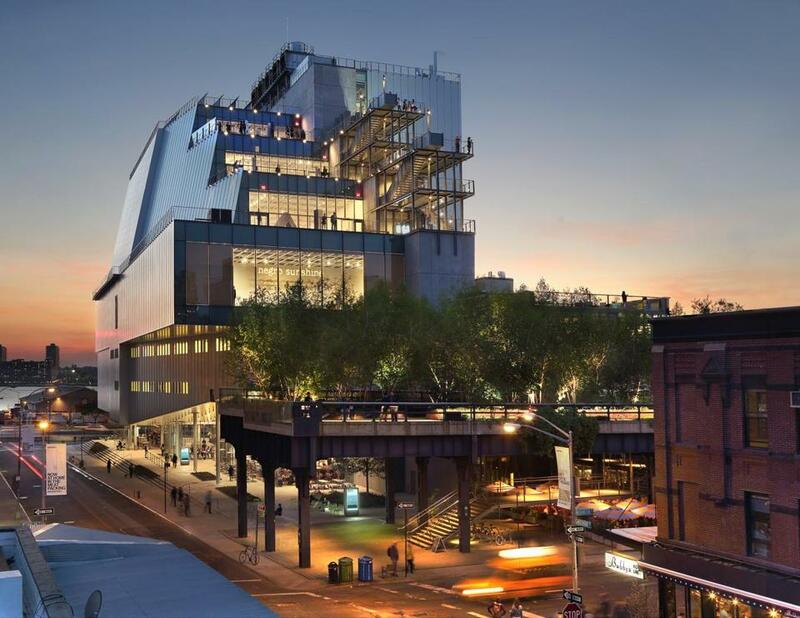 A view of the Whitney Museum from Gansevoort Street. Is any place so forgiving of last-minute travelers as the city that never sleeps? You can pull into Manhattan at 1 a.m. and still have plenty of time for dinner and drinks, and with more than 100,000 hotel rooms, New York will almost always have a place for you to lay your head. Catch the 4:15 p.m. Acela out of South Station and you could be on Broadway in time for a show the same evening. On our latest trip, we stayed on the edge of Tribeca at the Arlo SoHo (arlohotels.com), one of the many microhotels — very small rooms but captivating common areas — that have cropped up in Manhattan. After a day in Chelsea strolling the High Line (thehighline.org) and touring the Whitney Museum of American Art (whitney.org), we got dinner at the Mermaid Oyster Bar (themermaidnyc.com), where the clam chowder was as good as any I’ve tasted around here— and I assure you, I’m a full-fledged New England seafood snob. Nearer to the hotel, we lingered over happy hour craft beers, tasty small bites, and New York wines at Local & Vine (localandvine.com). For last-minute theater tickets, check the Theatre Development Fund’s TKTS Booth (tdf.org) in Times Square for discounted same-day seats, or ask at the theater box office the day of the show — you might even be able to scoop up unclaimed tickets right before the curtain opens. 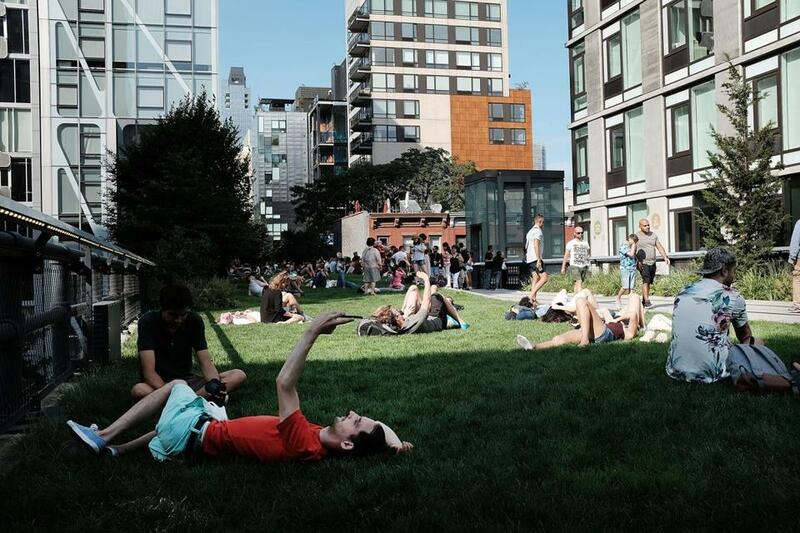 Visitors relaxing on the High Line. Traveling on a whim is easier with apps tailored to impulsive getaways. Travelzoo lets you search for last-minute and Groupon-style discounts at hotels and attractions specific to New England. Hotel Tonight specializes in locating rooms at the eleventh hour, but its options can be limited in smaller cities. I like Hipmunk, which allows you to compare rates at both hotels and Airbnb listings. And if you’re sick of the car or want to flee farther away, search GTFO (Get the Flight Out) to find the cheapest flights leaving Logan in any direction in the next 24 hours. Once you’ve settled on a destination, enter the location into PackPoint, an app that checks the weather at your destination, quizzes you on what activities you’ll be doing, and recommends clothing and accessories to match. Jon Gorey is a regular contributor to the Globe Magazine. Send comments to magazine@globe.com. Follow us on Twitter @BostonGlobeMag.